So today, I woke up with a sudden need to whip up some of these. And I was happy to know that I already had blackberries and yogurt sitting in my fridge. They do make a lovely pair with just the right balance of sweet and tart. You can definitely substitute whatever fruit you have at hand. Any way you want to mix it up is fine by me. Preheat oven to very slow 250 degrees. Mark an 18cm circle on baking parchment paper; place paper making side down on greased oven tray. Beat egg whites in a small bowl with electric mixer until soft peaks form; gradually add sugar, beating until dissolved after additions. Fold in corn starch and vinegar. Spread meringue inside circle on prepared tray. Do not squash or flatten mixture, but shape side up and in towards center, like a mound using a spatula and level top. 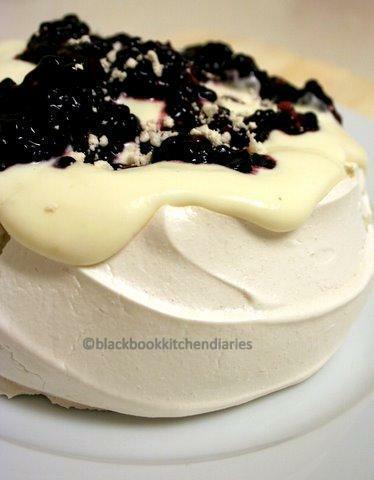 Set pavlova on a serving platter. 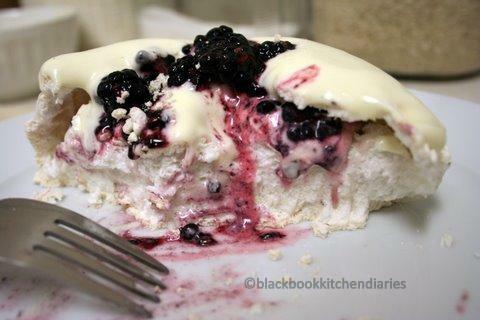 Then spread the yogurt cream mixture on top and then decorate with fresh blackberries. Finally dust lightly with extra sifted icing sugar, if desired. Just before serving, whip heavy cream to soft peaks, adding the sugar and vanilla. Then fold in the vanilla yogurt to the whip cream mixture. You make it sound so easy! Going to make it for dessert tonight! Wow that sounds so AMAZING and yet so simple…can’t wait to try this unique dessert.